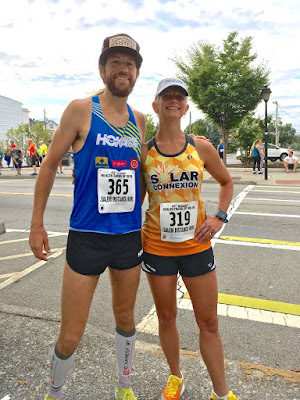 Cort the Sport: The Salem Distance Run 10K: A return to my first-ever race! The Salem Distance Run 10K: A return to my first-ever race! Today I ran the 10k at 43rd annual Health Focus Salem Distance Run. 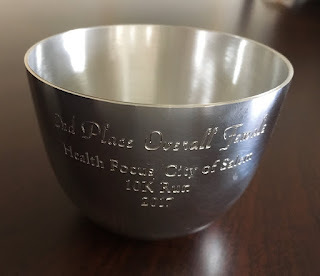 It was meaningful because it marked my return to the VERY first road race I ever did in my life, the 2008 Health Focus Salem Distance Run, when I was 41 years old! I ran a 53:26 then (and a 47:51 today) and I have no recollection if it was the same or a different course. I do know if gave me an incredible sense of accomplishment and I was hooked. I've been running ever since!! I found out that my friend Robin also made her road racing debut the very same time as me and she's also still at it! She finished 3rd overall female in the 5K. 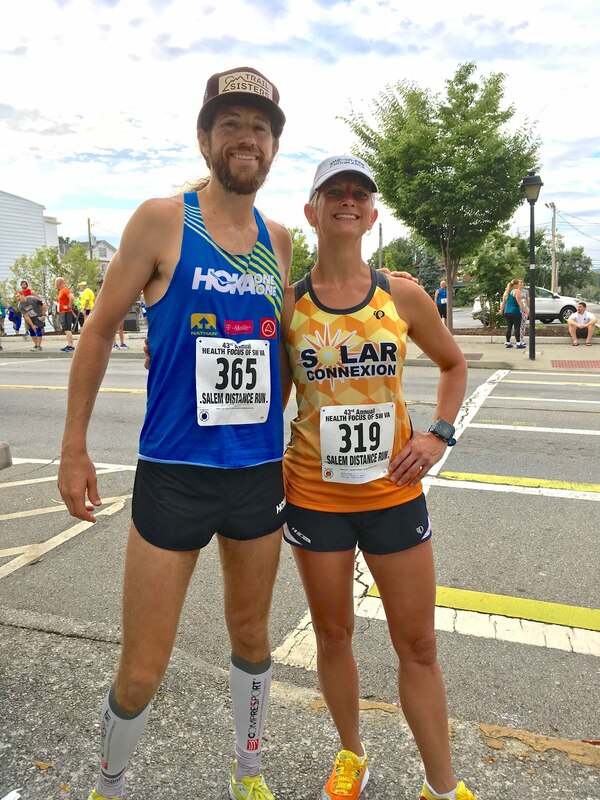 Michael Wardian, the extremely talented marathoner and ultramarathoner from Arlington, VA, has been coming to this race for the last 12 years or so? (I missed the exact year.) His list of accomplishments is long. Last year he set the world record (total run time) for running 7 marathons on 7 continents in 7 days. He's finished 45th at Boston. He's gearing up for a 400k in the Gobi Desert. Anyway, it was super fun to see him there and I shamelessly asked for a picture. He of course ran the 10K the fastest (34:45, a 5:34 pace! ), took some time at the finish, and doubled back to help at the last water station, arriving before me, the runner, did. 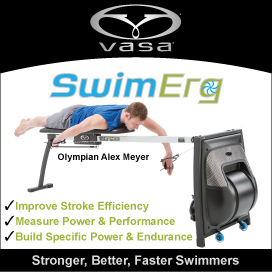 Unlike many sports, professional runners and triathletes are so accessible to us recreational types! We share the course and the conditions, and the struggle is the same for all of us (their struggle is just faster and over with sooner!). There is nothing analogous in other sports like basketball, football, or soccer. Would (insert name of famous sporty person) come to your local (insert name of sport)? Michael ran the race, helped out on the course, then announced all the awards! I would highly recommend this race to others. The 10k is a nice/different distance and there are not a lot of local opportunities to run that. The course is interesting with plenty of turns and short hills. Turns were well marked with very large chalk arrows on the asphalt and there were plenty of course marshals. You could feel that the race organizers and volunteers had a great deal of pride in the race, the community, and their mission! The race benefits scholarships in the health field and is well supported by sponsors. In addition to nice awards, they offered many nice door prize packages. Following the race, I changed my clothes and headed out for a 26 mile bike ride, with several miles in a refreshing downpour. It was a great day of training!! Luray International Triathlon: Seconds matter!